With PlatoForms you can build three types of forms: online web forms, online PDF forms, and master forms. Step 1: Click the purple Start to build button in the left column of the dashboard. Create Online Form for an Existing PDF Use this option to build an online web form or an online PDF form using an existing PDF. Create Master Form for Multiple PDFs Use this to create a master form to generate multiple PDFs. Create PDF Form from Scratch Use this to begin creating a PDF form—even if you don’t have one to convert. Step 1: Click the Creating Online Form for an Existing PDF button; when the option appears, upload your PDF. Step 2: Select the type of form you want to build. Online Web Form Transform your PDF form into an easy-to-use web form that’s compatible with all web browsers, provides an excellent mobile experience, and is quick to load. This option takes slightly longer to build as you have to complete the web form and PDF field mappings. Online PDF Form It’s easy to build, keeps all the original details from your PDF, and is suitable for any complex PDF form. This form is only compatible with the latest web browsers, such as Chrome, Firefox, Opera, Safari and Edge; not Internet Explorer. You might experience slow loading times if you’re using a PDF with a lot of images. 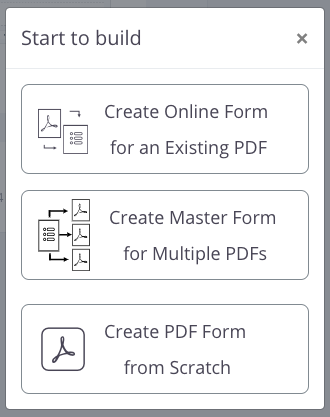 Step 1: Click Create Master Form for Multiple PDFs. This opens the master form. The Master Form Initially, the master form does not link directly to a PDF. Once you leave the master form editor, you can upload the PDF files and start building linked PDF forms. Use the link form editor to move a widget from the master form and map it to your PDF. You can upload and create as many forms linked to your master form as you want. As forms get submitted, the linked forms will generate PDF files based on the mapping.